Happy October Friends! Isn’t the change in weather gorgeous? The air, so invigorating with the chill. The crenellated orange globes of pumpkins appearing in the bins outside of the grocery, rousing your inner child. The faint, wistful scent of woodsmoke perfuming the air from another building in Denver that has inexplicably exploded. It is indeed a magical time of year that raises many feelings, most of them good ones. October is a time where people begin to withdraw into themselves, to nest and reflect on the year before the tumult of the holiday season proper begins. It can also be a time of difficulty for those with depression, with the days getting shorter and darker. October is Mental Illness Awareness Month and RMRG would like to take a few moments out of your regularly scheduled programing to discuss. The term “mentally ill,” is the hugely broad stroke term that people use to paint and describe everything from depression, to schizophrenia, to narcissistic personalities and the rest of the 200 other classified mental disorders out there. Despite the rampant prevalence of mental illness in the world (for example an estimated 275 million people globally are diagnosed with anxiety disorders) there is an overwhelming stigma attached to it, so that it’s generally swept under the rug, dismissed or ignored. This stigma isn’t a new thing. Historically humans don’t have a great track record regarding the mentally ill and differently abled. We are, however, getting a little better these days, and the trick seems to be like with most subjects shrouded in mystery, misunderstanding, and shame, to talk about it. Depression is one of the most common forms of mental illness out there (300 million globally) along with substance abuse and anxiety disorders. Well! The population at large must be in full possession of the facts if it’s so rampant, right? Despite depression touching so many, it’s alarming that people’s “facts” about depression are things like: individuals become depressed only after a negative event, they’re just blue and it’s not a big deal, and that they can “snap out of it,” if they wanted to. Derby is known for well-organized debauchery. Skater check in is at 5 PM, the bout is at 6 PM and getting crunk time is from 7:15 PM onward. Type RollerCon Black’n’Blue Ball into your search engine right now and you’ll see what is meant. The bumper sticker My Drinking Team has a Derby Problem, is a glib but not inaccurate representation of our culture. By and large, derby folk are a fun loving, hard partying bunch. It kind of goes hand in hand with willingly playing a game where people are deliberately trying to knock you over. So not drinking and winding up in the hotel swimming pool after hours, fully clothed and brandishing an In-N-Out burger bag like it’s a sack of gold, is not something that’s usually associated with our sport. Animal’s story is not an uncommon one. Another skater we spoke to in the league who chose to remain anonymous, told us about her senior year of college and the two years afterwards marked by what people call “functional alcoholism,” (a person who outwardly does the things they are “supposed” to do, like holding down a job and relationships). Privately she was being dragged increasingly further under by her drinking, and showed no signs of stopping, or even slowing down, despite suggestions or pleas from friends and family. She justified herself since she was holding down two jobs, was never absent or late for either and graduated on the Dean’s List, typical behavior for most high-functioners. For almost 2 solid years she was stuck in a wheel of self-punishment, relapse and grief. Dry spells could last weeks or months before inevitably she’d be knocked off balance. It took AA, a therapist, and a pair of roller skates before she could get back to good. 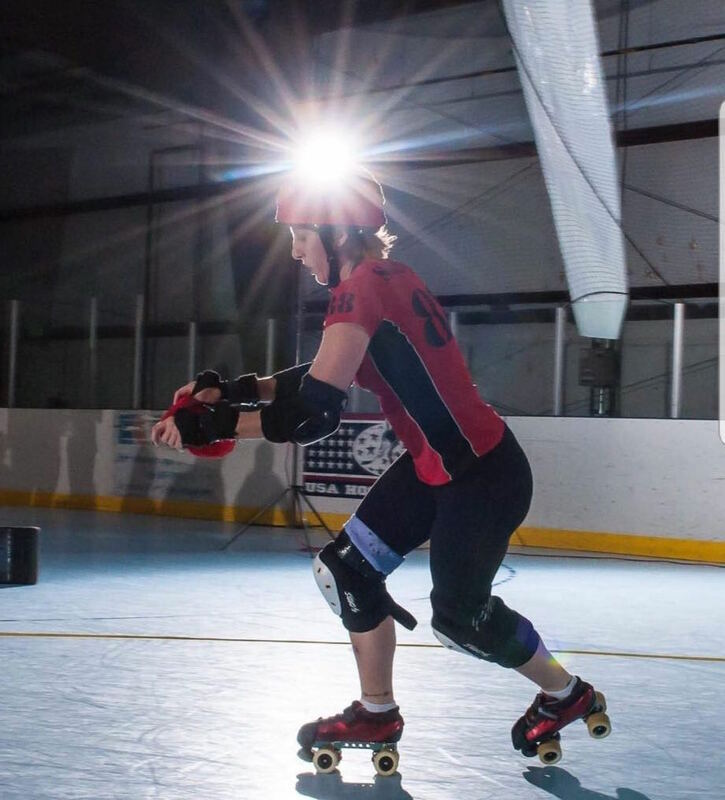 She still describes each day as “a gift and a fight.” This skater fully attributes a large part of her recovery to finding derby. “I needed a whole different horse,” she laughs. “And that was what derby was, something completely different. You have all this high voltage, nervous energy when you quit drinking, and I don’t just mean because you’re not hungover and hunting for pizza rolls anymore. There is a tremendous effort that goes into being wasted all the time, so in order to not just sit still and white knuckle, I bought a pair of skates. I watched a single practice and was all in. I was about 30 days sober and Bambied out of the dressing room in Derbyville where I was seated on the bench, and my mom went, So this is what you want? I’ll be forever grateful that she floated me the $250 for those first pair of awkward, clunky Riedell Vixens. Teams descend onto bottomless Sunday brunch mimosa bars like the Brides of Dracula onto an unsuspecting Transylvanian village. Locker room gift baskets for traveling games are full of lip gloss, silly string and shooters of Fireball. We can make a dragon boat of axe and mead horn welding Vikings look a Methodist Church Picnic. So what’s the appeal of derby for women in recovery? Simply put, partying is a perk, not the reason the sport exists. Skaters find community, support and passion in the game. Derby is about more than the extracurricular fun (it’s not golf for God’s sake). Skaters become hooked on the sport and how it transports and transforms you; something that most skaters will attest to, no matter what their situation or struggle. Both women are in agreement about the confidence boost that derby provides. Rocky Mountain Rollergirls would like to celebrate those in recovery in Derby around the world and offer their love and support. We recognize your struggle and applaud your bravery. We allow that the disease of addiction and recovery is complex, multifaceted and an ongoing journey and it’s not just about what you put into your body. We urge anyone suffering themselves to seek help, whatever that may look like, because if there is one thing that individuals in recovery can speak to, it is the danger of isolation. We also recognize the loved ones of those who suffer and offer our positivity and support. Addiction touches everyone around them, not just the sufferer, and to say that you too absolutely matter in this narrative, that your selfcare and wellbeing is also vital. Thanks for those who share their story, bless those who find solace in the sport and community of derby, props to those who support their fellow teammates in times of trial as well as happiness, and for those on the road to recovery, jam on. For an overview of information, please visit the Substance Abuse and Mental Health Services Administration Website.